Many anglers are put off using multiplier reels (also known as baitcasters) for their lure fishing because of fear of over-runs and the mistaken belief that these reels are complicated pieces of machinery. Don't panic! Multipliers are easy to get to grips with. All you have to do is set them up correctly and practice a little. Initially it is a good idea to set up the reel so that over-runs are impossible (or nearly so). To do this rig up the reel on a rod ready to fish and attach a lure to the trace. Reel the trace up to the tip ring and, holding the rod horizontally, disengage the spool and allow the lure to drop unhindered. If the spool continues to revolve when the lure hits the ground (throwing loose coils of line) the casting brake is set too slack. Tighten this brake a little and repeat the process. By carefully adjusting this brake you will arrive at a situation where the spool stops spinning the instant the lure touches the ground. Because this brake acts directly on the spool's spindle it should not be over tightened or the spindle might get distorted and affect the performance of the reel. When changing to a lure of a different weight you should re-adjust the casting brake. Most multipliers have a centrifugal braking system which is intended to control the speed of the spool during the cast. 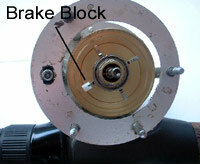 This braking system consists of a number of small blocks which are thrown outwards to bear on a drum as the spool spins. Some reels will have two blocks, others four and some might have more. By adding or removing blocks you can alter the braking effect. When learning to cast with a multiplier start out with more rather than less! Various sizes/weights of brake block are also available. Plastic blocks (as shown here) come in white (heaviest), black (lighter) and (apparently) blue (lightest), further aiding control. Older models, and some current RHW models have fibre blocks which come in different sizes. Fibre blocks can be fitted to non-UC models if that takes your fancy. Underfilling the spool with line will also make the spool slower, and so reduce the chances of over-runs. If you overfill the reel you will only end up cutting the line back as you try to unravel tangles anyway. Thicker lines are less prone to causing over-runs too as they cause the line level to drop more quickly. Light lures and fine, springy nylon lines have probably accounted for the undeservedly bad reputation multipliers have acquired over the years. Lures over an ounce in weight fished on limp braided line automatically make over-runs less likely. A rod with a trigger grip reel seat is a real plus for lure casting with a multiplier. The trigger will actually enable you to relax your grip on the rod and reel, the rod almost hanging from your finger on the trigger. Having a comfortable grip on the reel is important, and I like to have three fingers in front of the trigger (others prefer to have just two), and to be able to get my entire thumb over the spool. I feel that this gives me a better grip when casting heavy lures and prevents the spool slipping during the cast. Adopt the grip which is most comfortable for you. To make a cast it is preferable to begin with the rod in front of you and your lure hanging about two feet below the rod tip. The secret of casting with a multiplier is to keep your movements fluid and smooth. 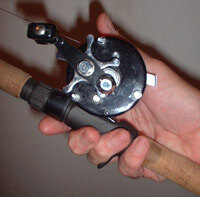 Put your thumb on the spool, push the spool release and take the rod back over your shoulder. When you feel the weight of the lure flex the rod begin the forward cast and release the pressure of your thumb on the spool as the rod begins to unload. If you have set the reel up correctly the spool should stop spinning when the lure hits the water. Using a rod which is balanced to the weight of the lures being used makes for smoother and more accurate casts. Very stiff rods are difficult to cast smoothly with, some degree of flex in the tip is desirable even when fishing with very heavy lures. When striving for maximum distance, remember to aim high as in the photo of Pete Wadeson below. With your reel set up as described, you might notice that you can't cast your lures as far as someone who has had more experience. Most likely this will be because they have set their reels up to be more free running and are using their thumb to control the spool. As in the picture above they might have removed a brake block or two. 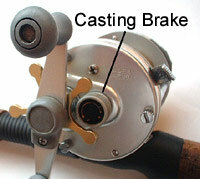 It is also likely that their casting brake will be adjusted to apply minimum pressure to the spool's spindle. Set up like this it is possible to cast a wider range of lure weights without the constant need to adjust the casting brake. An 'educated thumb' is the best braking system you can have. A well trained thumb can sense when the line is starting to fluff up from the spool and automatically apply pressure to slow the spool. Only when casting light, or unaerodynamic, lures into a strong wind will you then need to concern yourself with the casting brake. 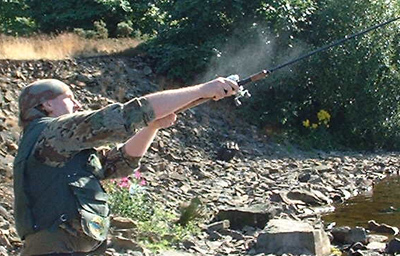 When you have mastered casting with a multiplier, which won't take long, you will come to realise that it offers so many advantages over a fixed spool for lure fishing that you will not want to return to a fixed spool reel as long as you live (unless you fancy a bit of ultra-light fishing, that is). For lures in excess of one ounce weight there is no contest - the multipliers have it! To find out why I like Ambassadeurs go to A Reel Recommendation.